As I mentioned last week in How to Become a Vegetarian, a big diet/lifestyle change is not easy. If you are trying to eat less meat, or are making the commitment to be a vegetarian, these tips might help. Visit a farm or animal sanctuary – If you crave meat, visit some local cows or piglets. Really look at them and see how they interact with you. Fall in love with a furry friend, and you might not want to eat it. Don’t expect everyone to embrace your new diet – I haven’t eaten meat in several years, but my family and most of my friends still do. Big change is scary and can be uncomfortable. Not everyone wants to “go there”. Read about CAFOs – Educate yourself about how meat is put on the table. Watch the Earthlings movie or trailer if you can get through it – If shock and awe inspires you to make changes, watch this movie. Have compassion – Extend the same kindness you have for animals, to yourself…especially if you slip. Don’t be a junk food vegetarian – Just because potato chips are vegetarian doesn’t mean they should be a staple of your new diet. Try new fruits and veggies – Add some new flair to your apples and bananas. Don’t overlook certain produce because you’ve never had it before. Choose wisely – Eat by color, not by calorie. Don’t over do it on the soy – There are so many substitutes for meat on the market, but start with fruits, veggies and whole grains. Veggie burgers, hot dogs and other soy based substitutes should supplement your diet, not be the foundation. Take a vegetarian cooking class – I am taking one next week and can’t wait to learn to cook something new and meet like minded veggie chefs. Don’t expect a veggie burger to taste just like a meat burger – “It tastes just like…” is a running joke in my house. Appreciate the new flavor and textures of your vegetarian diet and don’t constantly compare to meat. Buy local produce – visit farms, and farmers markets or consider buying a farm share through CSA. Buy organic produce – especially if it’s on this list. Grow your own – plant a garden or just a few herbs and veggies if you don’t have the space or time for big garden. 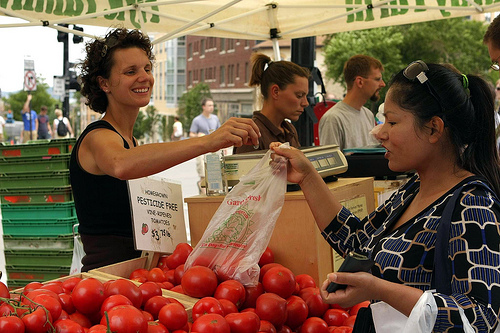 Eat what’s in season – It’s less expensive and the flavor and aroma of a fresh tomato is worth the wait. Bring wilted veggies back to life – Soak wilted greens, carrots or celery in cold water for 20 minutes to bring the crunch back. Be offended – 90,000 cows and calves are slaughtered every day, just in the U.S. and 14,000 chickens are killed in the United States every minute. Remember meat doesn’t equal muscle – There are vegetarian body builders and ultra runners (check out Matt’s story at No Meat Athlete) . Even gorillas are vegetarian! Make soup – Blend and heat up two tomatoes, 1/4 onion, a carrot, veggie bouillon cube and a little pepper. Make juice – If you have a juicer, try a handful of rainbow chard, 1/2 cucumber, 1 lemon (with rind), 5 or 6 stalks of celery and 1/2 of an apple. Read books that support your new diet – See five of my favs below. Recognize that fish have feelings too – I ate fish long after I gave up chicken and beef but finally decided that I couldn’t eat anything that has a mom. Appreciate the health benefits of giving up meat – Have a check up and your cholesterol checked when you give up meat and then again 6 months later. Dine out – Most restaurants have vegetarian options, but check out a local vegan restaurant for some unique menu items. Look forward to more energy – It can take your body three days to digest meat. There is a lot of energy required to get a steak through your system. Now that you are eating a lighter, kinder diet, your energy levels will soar! Awesome tips. Recognizing that not everyone will embrace it or understand it, or needs to, was big for me. Letting go fish is still a tough one but you’re right about the “mom” factor. Loving kindness is a great way to think about eating. Great tips on bringing veggies to life again too. Did not know that. Hate to waste so that’s a good one. Thanks for this wonderful, heartfelt and practical advice. Katie, fish and shellfish was the hardest thing for me to give up but now that I have, I don’t think I could go back. Next – I am going to work on cheese! Very nice post. Someday I will make the switch to a vegetarian diet. My attempts so far have been much less than successful. I like your writing, and I hope we can arrange a guest post exchange on our blogs soon. Let’s talk about it. Great post. I was a veggie for over 12 years, I now have a very occasional piece of meat or fish. I think we should all know exactly where our food comes from – I go to a local, organic farm where you can see how the animals are looked after and exactly where your meat comes from. Eating something from a factory farm, stuffed full of antibiotics, growth hormones and more is awful. I also think if you are going to eat meat or fish you shouold be prepared to rear, kill and prepare it yourself. This sounds a little wrong but I think knowing where your food has come from is essential. Thanks for the list of best organics – v interesting. And I agree about junk food veggies – living on pasta and cheese is not a good diet!! Kate, I actually tried the pasta and cheese diet and I highly recommend it if you are interested in gaining five or ten pounds and feeling lethargic all day! Oh my God… I just followed the advice number 4 and watched the Earthlings trailer. Although I knew a lot about these things in advance, seeing them on video was shocking. Thanks for the tip! But I did have a question too. About #8: “Eat by color, not by calorie.” What does this mean? What colors are good, how do you pick, and so on? Any link to more advice would be cool. I will elaborate on color over calorie in a future blog post (thanks for the suggestion!) Overall, I think if you choose a variety of colorful fruits and vegetables instead of worrying about restricting calories, your body will respond positively. Not only will you be consuming fewer calories but more natural vitamins and minerals. More details coming soon! Courtney! Well done. Great tips! Great article full of tips for a new vegetarian Courtney. I learnt how to become a vegetarian by joining a few websites and newsletters on how to start the vegetarian lifestyle. I really liked Vegetarian Newbie http://www.vegetariannewbie.com newsletter which is great for new vegetarians looking to get started. Im a newbie to this whole veggie new way of life. Over the past 4 years I have incorporated major changes to my diet by the increase of veggies of all varieties into me and my families diet. As of 2 days ago, I have quite meat all together. In fact, right now for instance… I am feasting on a butternut squash,onion,and mushroom mix – along side a brown rice mixed with longgrain and wild rice with blackeyed peas. I would never have eaten this in a million years. But I am trying to make this change. But I need help. can you send me some information on how to get this life style up an moving? sometimes I feel unfulfilled after i eat. like I need something more hearty. are there receipees you guys find fulfilling and delicious? Im so interested. oh. and I saw the earthlings video OH MAN OH MAN how aweful. I heard that things were not humaine in slaughter houses but I had No Idea…Thank you for enlightening me. My heart broke seeing that stuff.